Forgot to note previously but the body of this fan is brass as well. 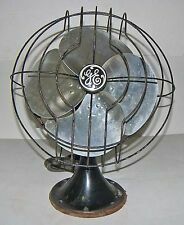 Antique Vintage Electric Fan. Condition is Used. Excellent working fan that is whisper quiet. 8” blades. For safety reasons the original cord should be replaced. Responsible bidders only please. 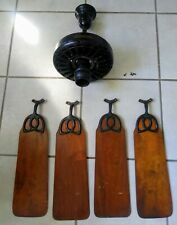 ANTIQUE 1920'S GENERAL ELECTRIC CEILING FAN 52" W/ MAHOGANY BLADES - WORKS ! WONDERFUL ANTIQUE 1920'S GENERAL ELECTRIC CEILING FAN FOR RESTORATION - IN WORKING CONDITION - BEEN TESTED AND MOTOR RAN FOR HOURS WITH NO ISSUES -- ALSO HAS A NEW SET OF STACK BEARINGS INSTALLED. SPINS SMOOTHLY ! ANTIQUE 1930'S EMERSON ELECTRIC CEILING FAN 3 SPEED 52" DIA. - ALL ORIGINAL !! ALL ORIGINAL ! THIS FAN IS TOTALLY COMPLETE AND READY TO ENJOY. ORIGINAL LEVOLIER 3 SPEED PULL SWITCH WORKD PERFECTY. THIS FAN IS IN ITS ALL ORIGINAL CONDTION - JUST CLEANED UP FOR THE PICS. THIS FAN RUNS BEAUTIFULLY ! STEEL GUARD. WORKS PERFECTLY ! SMOOTH AND POWERFUL - SEE THE VIDEO >>. 16" BLADES - STEEL. THERE IS NO SWITCH IN THE BASE, ITS MISSING - JUST PLUG IN AND SHE GOES ! Magnificent ventilator in bakelite big calor 220 volts. redo has nine in the style art deco it is adjustable in height and it is in working order. en bon etat de marche. Électrification OK. no copie original. IT WORKS ON 220-240 VOLTS, SO YOU WILL NEED A CONVERTER PLUG TO CONVERT FROM 110 VOLTS TO 220 VOLTS OF ELECTRICITY. THIS IS A HIGH QUALITY FAN & NOT LIKE THE AVERAGE MARELLI. MUSEUM RARE ESTATE FIND !! The blades and cage are brass, and the base and motor cradle are cast iron. When tested, it was found to work well. All three speeds. A cage support arm and a joint that let loose on the cage. The cage has not been painted, it was lightly bead blasted. 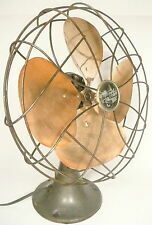 ANTIQUE A.C. GILBERT 10" OSCILLATING DESK FAN - (CIRCA 1932 to 1934). the motor was disassembled & thoroughly cleaned. all remaining components were thoroughly cleaned, polished, & clear coated as necessary (each screw & nut gets polished & the threads cleaned). Beautiful original condition. Runs and isolates without any problem. The fan oscillates smoothly and quietly in all three (3) speeds and in the highest speed creates a near category 3 wind force ! It has ALL the original cloth covered wiring and black bakelite speed selector switch along with new black felt bottom protecting felt. You just don't find them like this. AND TILTS FRONT TO BACK. SEE PICS FOR CONDITION. IT IS DRIED OUT AND CRACKED. ORIGINAL CORD. ONLY ISSUE. COLLECTIBLE QUALITY. This three speed Vornado fan, circa 40s - 50s, still runs smooth and quiet. An attractive grey green color will have it fitting in with most any décor or unobtrusively tucked into a corner doing its job. This 3-speed fan is working, runs and oscillates smoothly. Does not include a blade or cage, motor and base only. It has a little tarnish but is in good overall condition. But above all else.HAVE FUN! 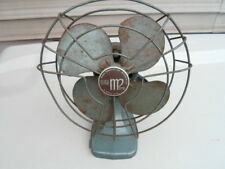 Vintage Emerson Electric fan, Type 79648-AP-G. 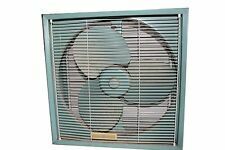 This is an oscillating, 3-Speed fan with cast iron base and motor housing. Very nice overall condition, and works well. It is very quiet for the amount of air that it moves. See photos for a better description of its appearance. Please email with any questions and thanks for looking. The back of the fan has a couple of shallow dents to the housing, which does not effect in any way the smooth performance of the fan. Fan is heavy, moves a lot of air, and is a pleasure to use. 3 SPEED - 16". BOTTOM OF BASE CRACKED. Vintage Rare Mini Table Fan Lakewood Model HV-4 Blue, Excellent Condition! This fan works great. Blue paint is scratch free and looks new! BEAUTIFUL ROBBINS AND MYERS HUNTER FAN. WORKS GREAT NO ISSUES. 3 SPEED OSCILATING FAN. This tilts as shown, there is a screw in it which has to be removed to tilt the fan. Condition is Used. Unsure of the model. One of the fans is missing the screw on the bottom of the blade guard. The blade guard is very tight.I don't know what the purpose of the screw is. I have two of these available. 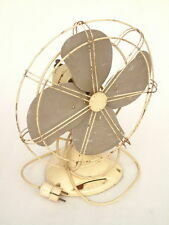 Vintage Eskimo Oscilating Desk Fan Model 15 Works!!! Cool Vintage Piece, shows wear for it’s age but works fine when plugged in!! 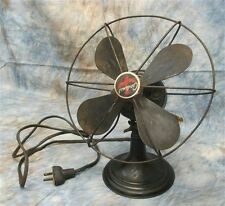 Original Nice little fan great for collection!!! This example is a model 12D1 with the unique early gray green base. It has it's original paint and several dents in the aluminum outer shell. The jailbar grill is in good shape with no breaks or issues. 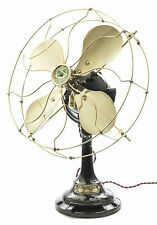 Vintage 1930's 10" Steampunk Antique Arctic Fan Sears Roebuck & Co.
From a New England estate. 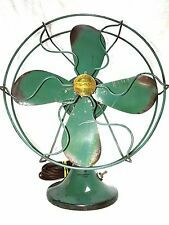 Great 10"W X 13"H steampunk ARCTIC oscillating fan sold by Sears, Roebuck & Co in the 1930's has a bent wire cage, great graphics, and overall retro appeal. Needs to be rewired and to be resoldered where the cage wire joins on the bottom. The face is about 9" across. It stands about 13" tall. Not original color as it is now Cream Soda Blue. It is not perfect but it is very nice. It has been tested in both the heat and cooling modes and runs great as shown in pictures. Vintage Westinghouse Fan 11" old part. Condition is Used. Shipped with USPS Priority Mail. UNLESS ITEM IS NEW, THEN IS DESCRIBED HERE. IF NOT OVERSIZED. See pics for detail. reference books, and many other unique pieces. This is a hand picked high end collection so keep watching, you will not be disappointed.